That is not what BLP stands for on Wikipedia, though you might sometimes wonder. This now-notorious three-letter acronym stands for Biography of Living Person. Wikipedia hosts several hundred thousand of them, and the summary deletion of a number of those has recently caused consternation and recrimination, not to speak of admin-on-admin disrespectfulness, of a kind that hasn’t been seen for, oh, all of several years. BLPs are troublesome because in real world terms they affect lives, in legal terms they may be defamatory, and in Wikipedia terms content policies must be applied very strictly, and still may give poor results. But they predominate among biographies: there is a decay law saying if you go back a decade by birth date the number of biographies for that year of birth drops off by a factor (could be something like 20% or 30%) and this is quite marked as you get back to 1900 and before. Around 1983 is the peak (over 8000), which tells us what? Duh, sport (Finnish speedway stars, anyone?) and popular culture. Editors add but do not necessarily maintain well numerous articles about young stars aged 27 or so who are mentioned in the media. Back among the grumpy folk known as “old school Wikipedians” the term “MySpace page” may occasionally pass the lips, but surprisingly, perhaps, there is a classic old-style inclusionist argument that works the other way. In a polite form it reads “if you come across work of others on the site that is substandard, your first task is to try to improve it, before cutting it or sending it for deletion”. In the matter of BLPs substandard means just one thing: references absent or low-grade. Wikipedia shouldn’t post things about real people out there that are just made up. We all agree. So, an editor finding a substandard BLP should try to reference it better. Nice theory. BLPs are speedy-deleted by the thousand as newly-posted pages when unreferenced, sometimes quite wrongly, because as posted they don’t have the references needed to support them (no verifiability and/or no convincing reason to support notability). The drama has come up when the same criteria, or stricter, have been applied to articles dormant on the site for years: unreferenced BLPs that seem not to be going anywhere better. So what is the “old school” counter-view? ‘Wikipedia has no fixed rules’ is part of the old-time mantra called the ‘five pillars’. Which allows for tectonic shifts in how things are done. Some anti-BLP activism has homed in on the broken nature of incremental change in dealing with the issue. Some BLPs are inherently problematic, functioning only as places of wars between supporters and denigrators of a real person (I have to babysit three of those). As Wikipedia expands, it gets into the area of biographies that are not that easy to reference. And such tenuous biographies may just have to remain, as things stand, because the inclusionist view amounts to saying that you are obliged to nurture them. And indeed better references or a controversy may turn up tomorrow: I started Ruth Padel never dreaming she’d be in the news so prominently. I read a history book by David Gress not knowing he was going to appoint himself to climate change controversy. So what has happened? The limited perspective that there is no real lower threshold for biography on Wikipedia has created another limited perspective, that only a radical cull and shift to a seriously summary deletionist policy on BLPs can save Wikipedia from a future as a morass of neglected gossip about real people. Some demonstrative admin actions on the site have brought the matter to the top of the agenda. These things get messy and costly in human terms, but the logjam gets broken along with the eggs for the omelette, and the real losers are peaceful editors who detest mixed metaphors. No, this is serious stuff, but the lurching motion is unfamiliar to those who haven’t seen Wikipedia in this mood. Did you know that the most venomous insect in the world is an ant? That’s right. One sting from the Maricopa Harvester Ant is equivalent to twelve honey bee stings — the required amount to kill a 4.5 pound rat. I found that over a year ago, through University of Florida’s Book of Insect Records. I immediately headed to Wikipedia to see what it had to say about it, but to my surprise there was no such article! I thus started one from scratch, using some information I found in several ant-related websites. Eventually people started adding information to the article, up to the point that it contained a fairly good collection of information about this fascinating species. But still one thing was missing — something that single-handedly could make the article ten times more useful: an image. So, when searching for images to illustrate it, I found the fantastic images from AntWeb, a project from The California Academy of Sciences, which aims to illustrate the enormous diversity of the ants of the world. I was especially happy to find that they were using a Creative Commons license — but soon after I was disappointed to find that the specific one they used (CC-BY-NC) was not appropriate for Wikipedia (or, more generally, free cultural works, and thus discouraged by Creative Commons itself). So I sent them an email suggesting them to change the license. When they replied, I found out that they actuallly had been internally discussing license issues for quite a while. I kept in touch, and made sure to let them know the advantages of having their work showcased in such high-traffic websites as Wikipedia, Commons or WikiSpecies. I like to think that my two cents helped in their decision, some time later, to not only change their license to CC-BY-SA, but also upload all their images to Commons themselves! This was part of their overall mission: “universal access to ant information”. Before, the AntWeb project focused only on digitization of content and development of the web portal; but now they also decided to “export” AntWeb content to improve access. Putting the images and associated metadata in Commons was an example their outreach initiatives. This was very welcome by the community, and there was a lot of input on how best to perform the mass upload in order to make the images easy to find and be used to illustrate articles and other relevant pages. The process took several days, but finally, over 30,000 images were uploaded, full with EXIF tags, taxonomic data, and geographic information when available. This is just the beginning, though! As usual in the wiki world, you can help! There are articles to be illustrated in the various Wikipedia language versions (Magnus’ FIST tool comes in handy for finding them!). There are WikiSpecies pages to be illustrated. There are categories in Commons to be created to allow the ant category tree to be navigated and have every ant image reachable through it. 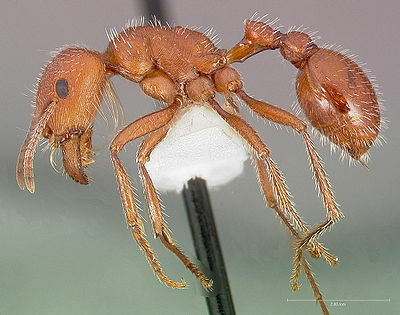 And more importantly, there are these great news to spread and let people who are interested in ants know that they can now count on what’s possibly the greatest online repository of free, high-quality ant images. Many thanks to Brian Fisher, AntWeb Project Leader, who coordinated the license change process, Dave Thau, AntWeb Software Enginer, who wrote the upload script and performed the upload, and to all the AntWeb staff for their outstanding work! Charles Matthews: Evolution, not Revolution? After a quietish half-year, by the drama metric (one of the two unsubtle ways to talk about the English Wikipedia, the other being article count), July is heating up. The constitutional issue is traditionally one great big grey area with a few livid spots. It may now flare up, with results that are less predictable than usual. Where does this upwelling of political angst come from? And will there actually be change? Successful constitutional innovations are in fact few, and the traditional demand for a new, good-looking-on-paper constitution is equally traditionally disappointed. The wiki technology has seen substantial changes, such as logging in with one username on all the Wikimedia (WMF) sites; there is nothing recent you can point to that has smoothly upgraded the social side of the site. In a startling reminder that those at the heart of the matter, the embattled Arbitration Committee (ArbCom), are anything but complacent about the general direction, stalwart Arbitrator Kirill Lokshin resigned a few days ago over the hostile reception to a plan for a new ‘plug-in’ to the system, taking one of the 2009 intake with him. The whole business is rooted in events of four or even five years ago: the period in which Jimmy Wales started to pull back from micro-managing the English Wikipedia (enWP). His role in the other language Wikipedias has always been largely symbolic, and one question is, with enWP still the flagship of the WMF, whether Jimbo should simply be a figurehead on the ship? This is not in fact a question the ArbCom has worried about too much about in the past (I should note that I have been out of the loop entirely for six months). If you take the issue of biography of living persons (BLP) as really concerning, much more so than constitutional niceties, the David Rohde story shows Jimbo still has a role as much more than a symbol: the editor of the New York Times phones him. BLP is vexed because there are hundreds of thousands of such articles, each one being a potential problem. When the ArbCom prompted a noticeboard to be set up the site for basic admin policing of BLPs in 2008, there was a predictable onsite row about the ArbCom overstepping its role in dispute resolution. (The OTRS email system gets something like 300 emails a week, typically complaints prompted by BLP troubles, but mere statistics cut no ice.) Jimmy Wales summarily deleted an article designed to attack a journalist writing about enWP: more attacks on him. The Rohde story was by remote control as far as Wales’s involvement went, but controversy raged. Was a life really at stake? Some people seem very certain about the answers to questions so indeterminate by nature. So Jimmy Wales has pulled back some way, and the real point is not that he is still active on some fronts, but that there is no single replacement. The ArbCom is there to handle the worst disputes, but as an elected body has become the default object of constitutional debate. The politics can look simple, one-dimensional: picture an axis with hard-line administration at one end (people who would talk about “executive decisions” if they could get away with it), and at the other end extreme free-speeches and wiki purists. At first sight this looks no contest: enWP is not a purist wiki, because it has content policy (see On Notability), and if you get out of line, there are over 1000 admins to straighten you up. No one says that Wikipedia guarantees free expression. But once you mix special interests into the brew, you find greater complexity. Divisive talk about admins versus “article people” is one sign of this; fringe science and featured articles generate such strong feelings; such matters can constitute planks in electoral platforms for, what else, ArbCom. The way this all pans out can be sometimes be read in detail on Wikipedia’s criticism sites, if you feel it worthwhile to make it past the sneery misinformation which is their usual stock-in-trade (believe me, unless you have 90% of the story straight already it is essentially impossible to extract value). What is hard to believe, right now, is that ArbCom+plug-ins, in other words the setting-up of some other bodies on the site to help management, is such a complete dog of a solution. In another part of the forest, there are people questioning Jimbo’s actual constitutional powers, namely (a) appeals from ArbCom decisions, and (b) implementing ArbCom election results by selection new Arbitrators. The scandal of User:Sam Blacketer shows that (b) is not a trivial matter: it’s the Internet, folks, and sometimes we’re in an episode of “House” with Hugh Laurie saying “everyone lies”. But in any case it is hard to see how to move ahead by evolution, not revolution, with (a) or with (b), without some sort of plug-ins. An impasse, and while I regret that Kirill resigned, I know how he feels. Wikipedia is taken seriously, now, something I wouldn’t change; I wish on occasion some of that seriousness would percolate into constitutional discussion onsite. Charles Matthews: What did we learn from "Matthew Hoffman"? Some ArbCom (Arbitration Committee) cases on the English Wikipedia can reach the mainstream media: there was a recent decision on Scientology-related editing which did just that. Others are very much for insiders, and the innocuously-named Matthew Hoffman case, the topic of a recent ArbCom statement, is an example. I brought the case, a year and a half ago. This will be part retrospect, and part a meditation on “ArbCom 2009”. What did we learn, then? The short answer is “not enough”. ArbCom 2009 has come to the view that the case should never have been accepted. I don’t think I’ll hire them as historians: the decision they have recently issued about the case is much the same as saying that in 2009 the case would not have been taken, and if taken would have been handled very differently. I’m not quarrelling with that conclusion since it is probably simply true, and it is well within ArbCom’s remit to reconsider matters and the way they were dealt with in the past. What catches my eye there is that justice was always an issue in the Hoffman case, since User:Matthew Hoffman was permanently banned by two admins on no evidence at all. That is one point, and the new statement changes nothing about it. And the other is that Wikipedia is a dynamic place. ArbCom 2009 is not ArbCom 2007 which accepted the case – only a couple of those Arbitrators are still there – and the whole context changes, particularly since ArbCom is an elected body. Elections also matter in this story, since both admins in the frame ran in the 2007 elections that could have put them on ArbCom 2008, and the case was concurrent with the election period. Someone else, before I got there, had put it to SH that the block should be reconsidered, only to be told that “sorry, it was consensus at AN”. Here’s another thing we learned, namely two admins on a noticeboard (meaning an unregulated onsite process) can decide to block someone indefinitely, on no evidence, and then fend off outside interest. That was as of 2007, and I don’t suppose the same uncritical attitude would pass muster now. It took some months for the matter to get to court, and I’ll not rehearse the whole history. The fact is that SH’s block was his personal responsibility, and was so treated by ArbCom when it took the case, which brought forth little general illumination beyond the SPA argument I have mentioned. It was shoehorned into being a case about SH; I (naturally) was recused, and this was not the inquiry I had wanted, but it was all out of my control. For more on the facts see my only extensive onsite discussion ; the matter is in the first two questions, but the joint statement in the blue box at the top of the page explains why I’m not going to cover this ground again, and indeed stopped short then. I was outraged by the whole business: a culture of admins being unreasonable rather than responsive in this matter just created a fall guy. Let’s hope that has changed. How should it all work, in the big picture? My view: admins should be granted plenty of discretion in using their powers to defend Wikipedia’s content and mission. But admins who make poor discretionary decisions should expect to have to defend those decisions rationally when challenged; and failure to engage and make an acceptable case is a serious question mark over the admin. It’s not the mistake (we all make them), but the attitude to discussing the decisions that make up the admin workload. The admin community is in potential conflict with the small ArbCom (of about 1% of the size of the admin body) that can remove their powers. Some other Wikipedias do without an arbitration process, and so the justice mechanism is the admin body and its self-regulation; but self-regulation can be flawed, too. ArbCom can review ‘community bans’, namely bans upheld by all admins, but this kind of review now rarely causes trouble and it is unusual for a community ban appeal to succeed; this path isn’t really controversial. The dispute that arose could certainly have been avoided by applying the maxim “thoughtful, not combative”. It was disastrous (all round) that a block discussed briefly at AN was confused with a community ban, with so much muddle. Was Hoffman a vandal, a sock, or a disruptive editor, and did anyone care which? None of the above: it was a bad block being covered up. Perfunctory discussion at AN must not be held up as deciding these matters once and for all. Why would it not have been important at least to know of what other account the Matthew Hoffman account was a sock? Why was he run off the site before being asked whether it was a real name? Those questions are pretty much rhetorical, but let’s not lose sight of natural justice. There has been strong advocacy, and much procedural argument, but let’s also hear it for the facts, evidence, and setting matters straight. Hoffman hasn’t returned to Wikipedia. Moving on, what do we learn about ArbCom 2009? The ArbCom, as of 2009, seems to be binding itself to operate in a more tightly constrained way, by placing emphasis in its Hoffman statement on procedural rather than evidential matters. We are back to justice, but this is more like the apparatus of the television lawyer drama. In fact the ArbCom was changing as of 2008, accepting many fewer cases than before, and we are now at perhaps 25% of the caseload numerically compared to the peak period in 2006/7. These cases are generally more complex, and take several times as long to close. The bigger picture is of admins plus ArbCom in tension on the English Wikipedia, as a shifting relationship that went through an uneasy period in 2008. We are certainly seeing some movement at the moment. Should Wikipedia have an article on Charles Herman Kuhl? Some people would think so. Kuhl’s claim to fame is to have been slapped around by George Patton, in “shell shock is for cissies” mode. The fact that we even have to discuss such an issue seems to me to be a good example of what is wrong with the “notability debate”. Starting in another way, I was asked in conversation at Wikimania about a proposal to create Wikipedia articles for each human gene. What were my reactions here? I said immediately, there should be no orphans, and the articles shouldn’t be any kind of walled garden. A walled garden would be some sort of sub-project that ordinary Wikipedia editors would find tough to relate to: say if the articles were hard to understand and edit in the ordinary way, or if standard deletion criteria were somehow suspended by fiat. Well, nobody can call off the deletionists that way. What I did not have as a first or second reaction is “are human genes notable”? I thought, I guess, that the genes are a big part of what make us us. It isn’t interesting to quibble about that kind of thing. I also didn’t react with a query about “reliable sources”. The way I’d go about such a project is with a big listing of the genes, first. Create articles (therefore not orphans) from the listing page(s). If gene XYZ is not really well documented yet, don’t create the article, but leave it on the listing with whatever verifiable info there is so far. If a new gene article is a bit thin, agree to merge it back into the listing pro tem. Over the years, the gene articles project should grow up to reflect the science. Where’s the problem here? Well, Wikipedia has its content policy, and part of that (or allied to that) is “topic policy” and/or “title policy”, the business of ruling of what topics the encyclopedia should cover, and the details of titling per topic. We tend not to talk about “topic policy”, and only vaguely about what is “encyclopedic”. Wikipedia anyway is only approximately an encyclopedia. What it is, really, is a tertiary source. And Wikipedia only approximately operates by choosing notable topics, in the everyday sense. It has a topic policy that allows topics in Sumerology to be selected according to what is notable to a Sumerologist. Quite rightly. Per field of endeavour, per academic discipline, Wikipedia is interested in surveying the major and minor but still reckonable topics. This is a different issue, by the way, from the mission statement “to provide the whole world’s information”. It is the question of the packages, not the contents. So, there are a few annoying and catchy misconceptions around. They are like the tunes to bubblegum pop songs, in the way that you can’t get them out of your head even if you want to. Notability doesn’t apply to facts, but to topics: you are probably thinking of verifiability. We don’t have “notable” facts, but facts have salience or not relative to a given topic (very relevant to BLP). Notability is just a guideline. It therefore cannot be a reason to force inclusion of a topic. This is where US Army Private Charles Herman Kuhl comes in. For all there may be a guideline saying notability can be assessed by the presence of good sources, it cannot be the last word: Kuhl was written up by Time magazine, doesn’t make him within sensible “topic policy”. An article about him, simply based on the Patton incident, is probably a classic ‘coatrack’ in fact, written to make Patton look bad rather than to inform. The catchy tune here is that “enough reliable sources make a topic notable”. Oh no they don’t. Enough good sources are probably necessary for a topic’s inclusion, otherwise the article will be paltry. But the witness, bystander or (in this case) passive victim in a famous incident is not really notable: the “Patton slaps GI” topic is clearly destined for all time to be a subsection in the Patton article. The necessary condition of reliable sources isn’t sufficient. Notability works adequately as a way to exclude topics at AfD: given five days to dig up reasons to keep an article, a sensible decision can often be taken, and the false positive and negatives are not so serious. A marginal decision at AfD decides the issue for six months, but not in fact forever, and debates are curtailed where they might cover imponderables. This works well enough. CSD A7 has worked much worse, in the past, and the bar has now been lowered: “An article … that does not indicate why its subject is important or significant. This is distinct from questions of verifiability and reliability of sources, and is a lower standard than notability.” This used to read in terms of an “assertion of notability”: the problem being that some people wouldn’t take office-holders to be notable for their office alone. An arguable point, but it seems to have been admitted that the “assertion” thing was broken. Topic policy isn’t as broken, but what we now know is that the catchy isn’t always helpful in this area. [[Category:Wikipedia notability]] is a subcategory of [[Category:Wikipedia content selection]], but completely dominant … around 100 pages in there, and only the Fancruft, Neologism and Recentism pages escape. Really, we should start to revamp, explaining more clearly what the policy on topics is. There were recent polls to try to change the policy, but I thought the proposals were nearly all wrong-headed, and probably aimed at some of the successful tenets we have. In effect we do not allow subpages in article space and insist that summary style, highly desirable as it is, operate only through individually notable topics. Here we see topic policy plus concision constraining content policy, and a good thing too. Some people might not know about the www.wikipedia.org template. That is the page that defines what appears on the main wikipedia portal, www.wikipedia.org. Evidently, the template is protected, and thus it is frequent to see people from wikipedias that reach milestones commenting on its talk page requesting an update. However, there is a draft version that can be edited by anyone. This is something more people should be aware of. If we remove all the requests for updates from the template’s talk, some very interesting thoughts show up, in discussions spanning several months and even years. These are proposals that cannot be simply put on the draft page to be later synchronized with the main template, since they would represent big changes that require some discussion first. One of these proposals is the “top ten rule” discussion. 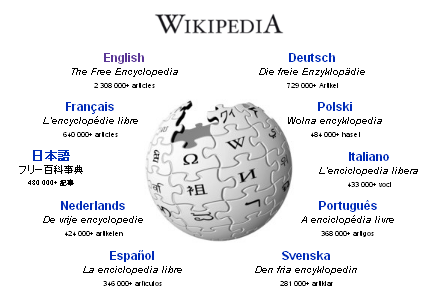 The problem is, when the wikipedia.org portal had first implemented the globe design with the ten wikipedias floating around it, the natural choice was the ten biggest wikipedias at that time. But when the Russian wikipedia started approaching the 100,000 milestone (the sections below the globe only went up to 10,000 at that time), many people started proposing its inclusion on the globe, since would “graduate” from the 10,000 level. But what most people didn’t realize, was that (quoting User:Mxn) “most of the top 10 editions were featured around the logo long before they reached 100,000 articles, so getting to 100,000 isn’t why they’re up there”. The fact that at some point they ended up being the only 100,000+ editions of wikipedia was merely coincidental. Nevertheless, those discussions about Russian wikipedia, and later the Chinese wikipedia (which led to the creation of the 100,000+ section under the globe) questioned the criteria of size for being featured around the globe (which never had been extensively discussed anyway), and proposed some alternative criteria, thus effectively lauching the seeds for a long-awaited reform. This is when the Top Ten Wikipedias discussion comes in. By collecting the ideas spread across the huge www.wikipedia.org template talk page and posing them together in a separate page, and providing a table with some actual results for the application of some of those criteria (and of course, some spamming around the village pumps for the biggest ‘pedias), the arena was open for a very productive discussion, which is actually ongoing at this very moment! The times are of change, and excitement is in the air. You could be part of the revolution! Go ahead, be bold and add your comment! How interesting that the “100,000+ rule” for inclusion on www.wikipedia.org was never originally planned. The proposal for a new evaluation of what constitutes a “top 10” is very detailed and worth a look, keeping in mind the question: what do you value most about Wikipedia? What factor makes a Wikipedia the most useful? Depending on which factors get favoured, the “top 10” could look extremely different to how it currently does. The question of “what do we value” naturally brings the case of the Volapük Wikipedia to mind (vo.wp scores a prominent text link on this portal, but not top 10 as of yet).